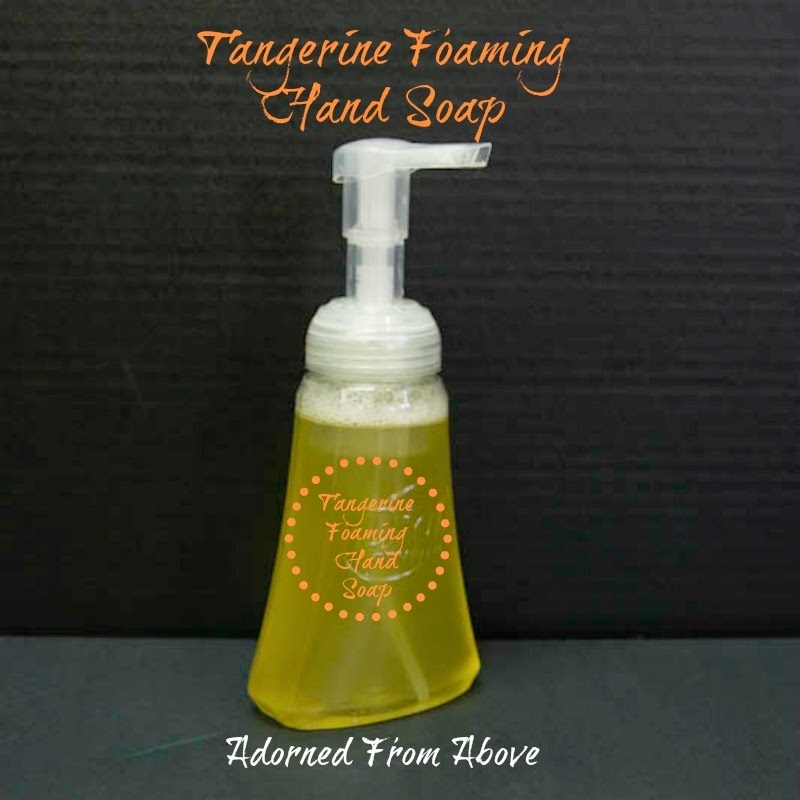 Today I will be showing you how to make Tangerine Foaming Hand Soap. 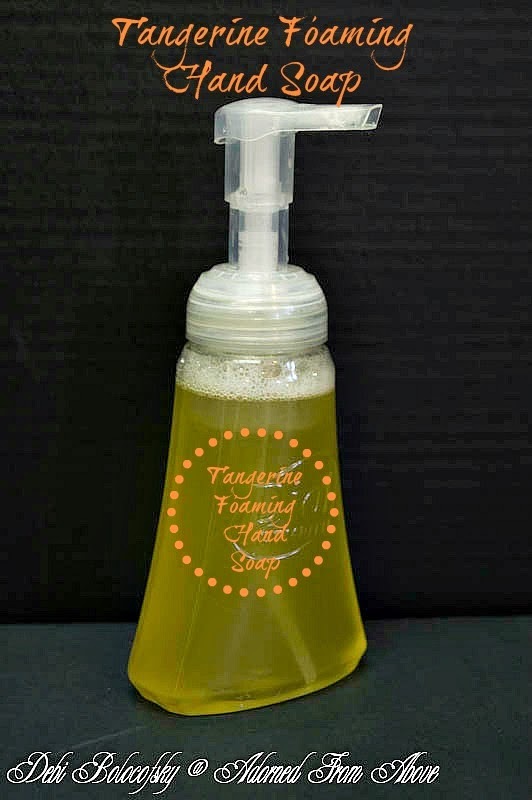 It is a really simple to make and much less expensive then buying liquid soap at the store. I ran out of my Dial Foaming Hand Soap yesterday morning and decided that I should just make some rather then buy it. I had everything on hand, and since one of my favorite essential oils is Tangerine, I decided to make it smell like Tangerines. I also re-used my Dial Foaming Hand Soap Container to make it foam. Put the distilled water in your container first. Next add the Dr. Bonner's Liquid Castille Soap. Then add the jojoba oil and your tangerine essential oil. Put the pump back on your container and shake. You are ready to go. It smells wonderful, and is great for in the kitchen. Here are the reasons that I have used certain ingredients. 1. Distilled water - I use this because is has less impurities, that could make your ingredients go bad. 2. Dr. Bonner's Baby Mild Liquid Castille Soap - This is a good all purpose liquid soap that many things can be made from. It is concentrated so it must be diluted with the distilled water. 4. Tangerine Essentail Oil - I love the smell of Tangerines and this is divine. It is also an antibacterial which is great for hand washing. You could also use Lemon, which would smell great also. I always love hearing from you. What is your favorite scented hand wash? I hope you like this Foaming Hand Soap as much as I do. This was so easy to make also, and the cost is just pennies. Great when you have kids who wash their hands a lot. I like this idea --- you could probably use the fractionated coconut oil (I know doterra has it) -- it stays liquid all the time. I'd love Lemon, Tangerine or Lime in the summer! During the winter, I'd use OnGuard -- smells like cinnamon/cloves. Thanks for the info. I have seen it before, but never used the fractionated coconut oil. I will have to look for the OnGuard. I have not seen that before also. Where did you buy it from? Definitely not a dumb question. You can get jojoba oil and Dr. Bonner's at a natural grocery store, like Whole Foods or Sprouts. You can even buy them online. Let me know where you live and I can give you a better idea of who would carry it in your area. They both go a long way. I even just saw jojoba oil at Trader Joe's the other day. They don't carry the Dr. Bonner's though. Hi ladies, i love this idea and pinned it! I never made anything like that before and I'm always having to buy the big refill at Costco! Have a great weekend.